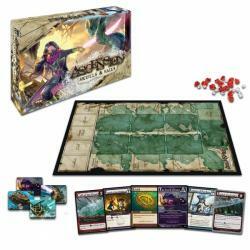 Justin Gary’s Ascension gets its 15th stand-alone expansion set this April when Stone Blade Entertainment and Ultra Pro Entertainment release the pirate-themed Ascension: Skulls & Sails set, following the February 15 release of the fifth annual Collector’s Edition. In Skulls & Sails, players have the opportunity to captain their own pirate ship in the monster-haunted waters of the Severed Seas. Using the familiar Ascension deck-building game mechanic, they pilot their vessels in search of treasure and monsters to fight or to raid enemy vessels. Skulls & Sails can be played on its own with 2 to 4 players, or it can be combined with another Ascension set for larger games. It includes 200 cards, 50 plastic gem honor tokens, a game board, and 4 pirate ship counter dials. The game is intended for ages 13 and up, and takes about half an hour to play. 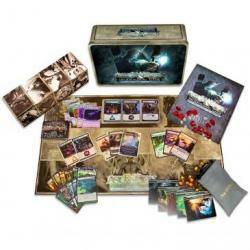 The Ascension: Year Five Collector’s Edition includes all of the cards released for the Ascension game in its fifth year. This year’s offering features foil versions of the cards from the Ascension Base Set, Ascension: Dreamscape, and Ascension: War of Shadows as well as all promo cards offered in the past year, a total of 320 cards. In addition, the set has a game board, 70 honor tokens, 30 insight tokens, a pouch to hold the tokens, and 5 card dividers to help player organize their cards. It is packaged in a full-color tin, and also comes with a more portable travel box.